I didn’t know that it’s faster to take a plane from Darwin to Dili than it is to fly from Melbourne to Sydney. However, standard of living-wise, education-wise, just about everything-else-wise between our countries is as about far apart as you could imagine. It’s easy to forget that less than 20 years ago East Timor was emerging from an Indonesian occupation that killed 20% of the East Timorese population and subjected the rest to starvation, torture and land confiscation (for the most part during this time our own Government was more concerned with Indonesian trade and sharing the untapped oil reserves in the Timor Gap than East Timorese human rights). When the occupation ended in 1999 the departing military bade newly independent Eat Timor farewell by destroying much of the country’s public infrastructure, removing major businesses, closing-down the government and burning villages and farms. Things really couldn’t have been worse and it explains today why the average full-time wage in East Timor is still around $10 compared to about $1000 over here. One thing that had been left after the Indonesians went home was coffee – East Timor’s largest export crop. During the occupation many abandoned colonial Portuguese coffee plantations had gone wild leaving the coffee plants to cross-breed in curiously tasty ways. Locals keen to earn some income had begun harvesting the beans but weren’t getting a good price from unscrupulous agents. At the same time NGO’s were trying to establish social enterprises that could help kick-start employment, education and health services as well as repair forests which had been 80% logged out. A chance meeting at Dili Airport in 2012 brought together Andrew Mahar, founder of reforestation NGO, WithOneSeed and Brett Inder of Tradewinds Tea and Coffee. Andrew, who had strong local connections with farmers was looking for social enterprise partners. Brett, meanwhile, was looking for a coffee-collaboration with a like-minded organisation working on the ground, and so WithOneBean was born. This was the beginning of a partnership that would bring together a suite of organisations and enterprises integrating community forestry, coffee growing, carbon trading and education. 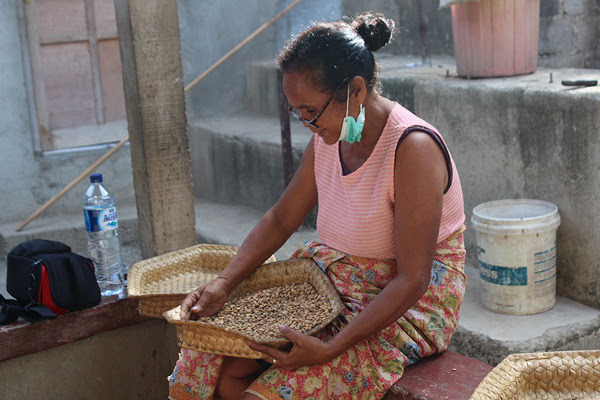 WithOneBean now supports 667 East Timorese coffee farmers who last year exported 20,000kg of green beans. The profits meant they could afford coffee farming training as well as better processing equipment. Meanwhile sister WithOneSeed program, working with subsistence farming communities to establish tree nurseries and replant forests, offset 896 tonnes of carbon through the first Gold Standard verified carbon forestry program in East Timor. We can contribute to the scaling of these projects and the people of East Timor by drinking WithOneBean coffee and lots of it. I know it’s good because the fussy coffee-drinking Fair Food staff go through bags and bags of it. WithOneBean’s coffee is roasted daily in Melbourne at Timor Coffee Roasters, all profits are returned to the coffee farmers and you can find it here. I think we’ll begin taking care of our world when we change our foundation stories that got us thinking we were separate from our fellow plants and animals. Getting to know sunflowers, dragonflies, chickens, our creek, the seasons, the way we make power from the sun and wind is a strand of a new story. You can help CERES help more people fall in love with the earth and tell a new story by contributing here to our Annual Appeal.